Complaints about summer box have evaporated with the release of well-marketed movies that people seem to actually like. Weird. Leading the pack is the PG-rated animated family comedy, “Despicable Me,” which starring voice Steve Carell has been madly promoting everywhere. The zany villain-centric tale has also benefited, as per Anthony D’Alessandro, from the usual cross-promotional synergies which are as diabolical yet effective as the words are annoying to write/read. The 3-D animation nearly doubled the already healthy amounts that I mentioned Friday and scored a weekend estimate of over $60.1 million today according to Box Office Mojo. It’s a much needed break for troubled Universal which is launching a new animation division with the film from two French first-time feature directors. Coming in at #2 was a quite decent second weekend for Summit’s “The Twilight Saga: Eclipse.” The PG-13 rated female tween-teen-young-adult attracting flick suffered an average drop of about 48% and brought home about $33.4 million worth of estimated bacon. The blood quotient rises considerably for the third genre flick in this week’s lineup, “Predators.” The action-horror pic, which according Jason Zingale, contains an unlucky character who is literally filleted, is apparently being greeted as a bloody good time for action/horror/creature-feature fans and brought in $25.3 million, just a tad higher than the higher end of expectations. That’s especially good considering the remarkably low budget by current action-film standards, $39 million, thanks to the cost-cutting genius of producer Robert Rodriguez and, one assumes, the efficient work of director Nimrod Antal. Following close behind is the latest leggy smash from Pixar/Disney. “Toy Story 3” generated $22 million in its fourth week, having already earned $140 million over its admittedly enormous (but no longer unusually large) budget of $200 million. I’m sure a lot of that is largely probably due to one of the highest paid voice casts in entertainment history, considering not only the status of Tom Hanks and, to a vastly lesser extent, Tim Allen, but also the enormous success of the prior films. Also, this level of CGI animation appears to be a pricey proposition, still. Last week’s very successful #2 film, the critically-loathed and C Cinemascore family-action pic, “The Last Airbender” dropped 57% in its second week to this week’s #5 spot. That is actually a fairly typical, though not great, drop for a genre film. Still, with a $150 million budget, critical nightmares of this TV-animation adaptation becoming a long-running live-action film series may remain the stuff of dreams. Meanwhile, expectations are also being exceeded in limited release. “The Kids are Alright” got the best per-screen average not only of the week but of the year with a whopping per screen of over $72,000 on seven screens. Also opening this week in a very large for limited 110 theater release was the second film of Steig Larsson’s Millennium Trilogy, which is quickly emerging as something of an international Harry Potter phenom for over-educated grown-ups. “The Girl Who Played with Fire” made it to the #11 spot with $965,000 estimated despite muted reviews. “Cyrus” continues to do very well, also. There’s more. As usual, the details as compiled by Peter Knegt are over at Indiewire. Over the three day Friday-Sunday weekend, Summit’s “The Twilight Saga: Eclipse” earned an estimated $69 million according to the Box Office Mojo chart. For the broader and potentially confusing numbers covering the extended movie weekends for the two new major new releases this week, I’ll rely on Anne Thompson’s pal Anthony D’Alessandro. He tells us “Eclipse” earned an estimated $175 million and change, just a few million bucks below the similar six-day frame of 2004’s “Spiderman 2,” though not adjusted for ongoing movie-ticket inflation. This is the point in the series ordinarily where some might wonder if interest is starting to flag, but this is a long-running movie/book soap opera and a continuing tale similar to the Harry Potter in terms of fan interest/involvement. Also, this entry overall got significantly better reviews than the second film in the series, which might indicate the film itself is more boyfriend friendly for this very female-driven franchise. Okay, so we’re back one more time to wrap up my series of posts covering my reactions to the movies I managed to see at the Los Angeles Film Festival. If time and my temperament permits, a special kvetching post will be forthcoming. You can see my earlier posts on the films here and here. * “Cane Toads: The Conquest” — I saw this the same night as I saw “Cyrus” and, while I got a bit tired towards the end, probably because it had been a long day, I couldn’t help but be delighted and impressed by this unapologetically entertaining documentary. Made in high end 3-D, writer-director Mark Lewis told the audience with some pleasure that his film has been dubbed “Avatoad” by several critical wags. Whatever comparisons there may be to the Cameron film, this one is definitely funnier. What it actually is a sequel to a twenty-five year old documentary (“Cane Toads: An Unnatural History”) detailing how these toads were brought to Australia to combat an agricultural pest. The amphibians utterly failed at that task, but utterly succeeding at reproducing themselves by the billion and being perceived as a pest themselves by displeased Aussies. The new film explores the various aspects of the creatures and how they interact with humans in Australia, with some making a sport of how many of the creatures they can exterminate, and others fighting to stop the slaughter or studying them, and, in the case of one little girl, making a pet of one beloved and friendly toad. 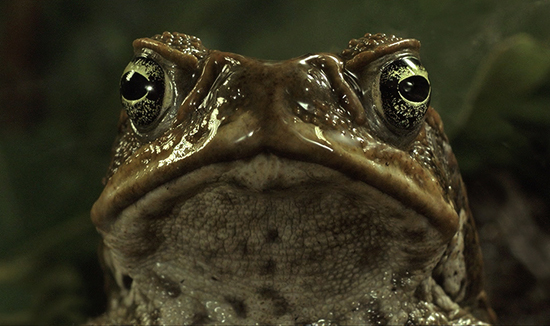 Full of invention and wit, “Cane Toads: The Conquest” is easily the funniest ecological nature documentary I’ve ever seen — it’s also, easily, the only one that could qualify as a somewhat dark comedy of sorts, a clever combo of science, silliness, and ecological awareness. As much as I liked the film, overall, I do have to admit that that was overshadowed by the fact that none other than Werner Herzog was sitting in front of me, who is said to be working on his own 3-D documentary. Exactly the guy you’d want to be sitting next to you at that kind of doc. * “Farewell” — This blend of fiction and documentary film is the tale of the 1929 round-the-world trip of the German Graf Zeppelin as reported by its lone female passenger, a real-life English journalist/aristocrat. Written and directed by Denmark’s Ditteke Mensink, the film is mainly a fictionalized story of starcrossed love, and the real-life writer really did have a lifelong secret love affair with a married colleague. Comprised entirely of found footage, mostly from the actual historical trip, which was probably the biggest zeppelin story until the Hindenberg disaster effectively killed lighter-than-air travel, the story is told in the form of a highly emotional narration in the form of a diary. Although I was as wowed by the amazing footage as many critics seemed to have been, I was somewhat disappointed with the film as a whole. Lacking the informational interest of a more conventional doc, the film didn’t really work as a drama for me either. 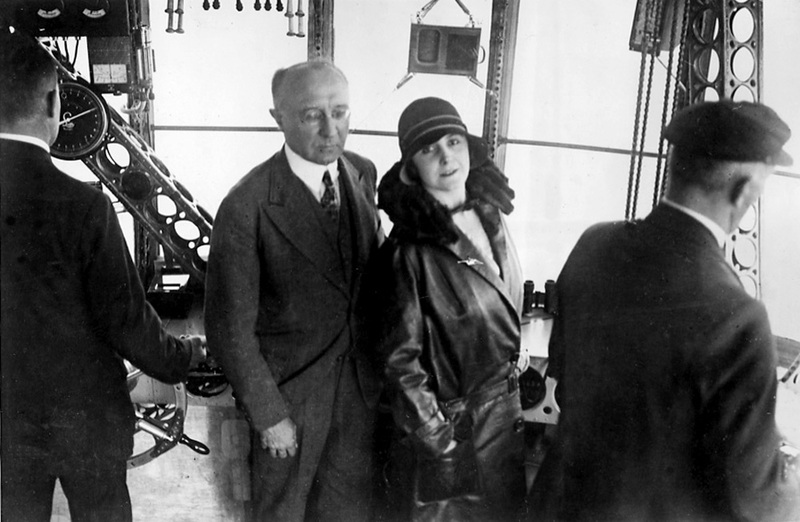 It’s bit humorless and static — especially since our male lead that our heroine is over the moon for isn’t exactly your usual dramatic leading man — and, like the zeppelin trip, the love story winds up largely where it starts. And that, believe it or not, is it — for the movies, anyhow.